Recent (2017) south Puget Sound regional needs assessments have identified food system infrastructure gaps, suggesting a need for dry, refrigerated and frozen storage, food processing facilities, grain mill capacity, and a warehouse for aggregation, distribution and collective marketing. Among other problems, lack of farm infrastructure in the region is dampening market opportunities, and likely contributing to long-term loss of farmland. Since 1950, farmland has dropped from 170,640 to 76,000 acres in Thurston County, and from 304,253 to 132,839 in Lewis County. 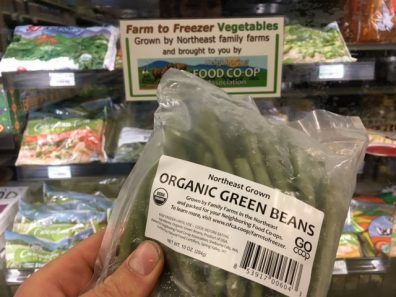 This project is exploring the potential of a vegetable processing facility to expand market access for crop producers in the south Puget Sound. This research project consists of a market and processing line analysis for a frozen food processing facility. Work in 2018 will evaluate buyers at farmers markets, hospital and school cafeterias, customers of box subscription programs, and others. For more information on this work, please contact Stephen Bramwell at WSU Thurston County Extension: bramwell@wsu.edu. Thanks to Port of Olympia for 2018 funding for this project! Facility design and planning will occur in 2018 – do you have ideas for equipment funding or skills with processing kitchen finances? Call us! 360-790-9308! WSU Extension Thurston County led a group of farmers, economic development personnel, and public representatives from Thurston, Lewis and Grays Harbor Counties traveled to Skagit and Whatcom Counties to visit grain, fruit, vegetable, and other farm product processing and marketing infrastructure. The Northwest Agriculture Business Center and WSU Whatcom County Extension arranged many stops on the tour. The trip occurred September 24th and 25th. The trip provided examples of farm product marketing infrastructure that is lacking, and needed in the south Puget Sound region. See a photo-heavy account of key trip take-aways here: Skagit Tour 2018_Notes. “How important is it to YOU that locally processed products use local farm products?” This question and six others were answered by over 500 market shoppers on August 11th, 2018. The goal of this market assessment was to evaluate customer interest in value-added fruit and vegetables products. Results from this work will help determine the feasibility of developing a value-added food processing facility in south Puget Sound. 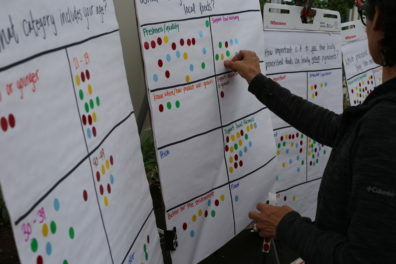 Here are initial results presented to the South Sound Food System Network in September 2018: FoodProc FacilityUpdate SSFSN 18-09-04.